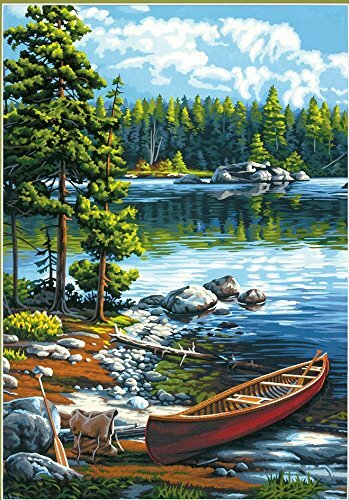 DIMENSIONS-Paint Works Paint By Number Kit: Canoe By The Lake. Dimensions brings you paint kits that are fun and quick to paint. With their color mixing you will achieve the subtle tones that make their designs look so realistic. Kit includes: pre-printed textured art board; twelve high-quality acrylic paints; a paint brush; and easy to follow instructions. Finished size: 14x20 inches. Frames and mats are not included. Conforms to ASTM D4236. Made in USA. Hinweis: Zwischenzeitlich ist eine Anpassung des Preises beim Händler möglich. Es gilt der Preis, der beim Händler angezeigt wird. Copyright © 2019 Malen-Nach-Zahlen.Tips . Alle Rechte vorbehalten.